Referee. Born in Winnipeg, he played all of his minor and junior hockey in Winnipeg. In 1953 he started officiating amateur hockey in Manitoba. Over a forty-year career he refereed in the Western Hockey League, the International Hockey League, international hockey and in all levels of the CAHA, including the Memorial and Allan Cup finals. 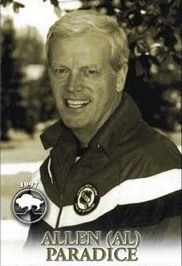 Al Paradice was also an NHL video goal judge from 1992-94.